Current implantable electronic devices like defibrillators, pacemakers and neural implants are made using silicon technology which by its nature is rigid. There is an increased trend to make such medical implants conform to the organs they are monitoring or supporting1. This not only provides comfort to the organ i.e. less abrasive impact with a soft and flexible structure compared with a rigid device but also allows the medical implant to be closer to the organ being addressed by conforming to the non-flat surface: the closer the medical implant is to the organ of interest, the higher the signal-to-noise ratio of the signal detected from the organ. Some groups are making their implants flexible by thinning down rigid silicon devices and placing them on flexible substrates. While this achieves the flexibility requirement, silicon electronics are not biocompatible or biodegradable. Additionally there is a limitation over which conventional silicon devices can extend and hence map an organ. This is due to silicon devices being very expensive. FlexEnable has created a truly flexible organic thin-film transistor (OTFT) platform that can be used to make complex circuitry like high resolution arrays or amplifiers that can be fabricated over small or large areas in order to make flexible medical implants that are potentially easier and more comfortable to implant, with no toxic materials. The organic materials are inherently flexible and can be deposited directly on various medical grade flexible substrates and therefore the fabrication process is lower in cost compared with conventional silicon technology. Some research groups have created concepts using OTFT circuitry and other variants like organic electrochemical transistors (OECT) for monitoring brain activity and organic electronic ion pumps (OEIP) for drug delivery or developing artificial muscles. While these concepts are a great first step to provide medical evidence for their efficacy there is still a requirement to industrialise these device concepts at a viable cost. FlexEnable’s truly flexible electronics platform can help realise these device concepts and bring them to mass manufacture. 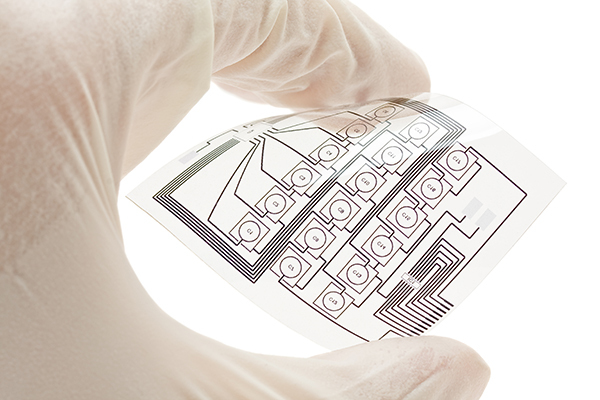 For more information on our flexible electronics technology and partnership opportunities please get in touch with FlexEnable at info@flexenable.com. 1 The rise of plastic bioelectronics by Someya et al.